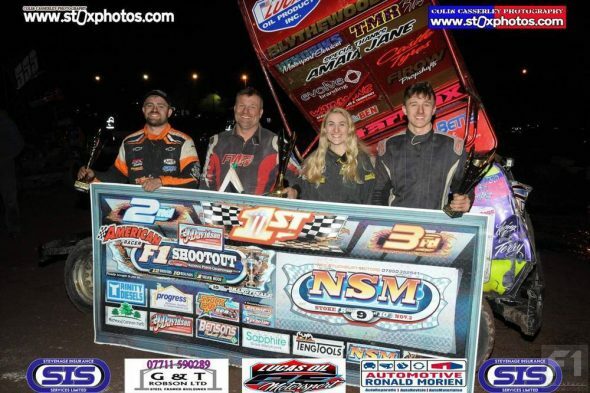 With the news that Stuart Smith Junior would have to sit out the remainder of the season following injuries sustained in the heat two crash at Northampton last weekend, the 2018 Shoot Out has become predominantly a three horse race with a couple more drivers in with an outside chance of victory if the top three fall at the final hurdle. 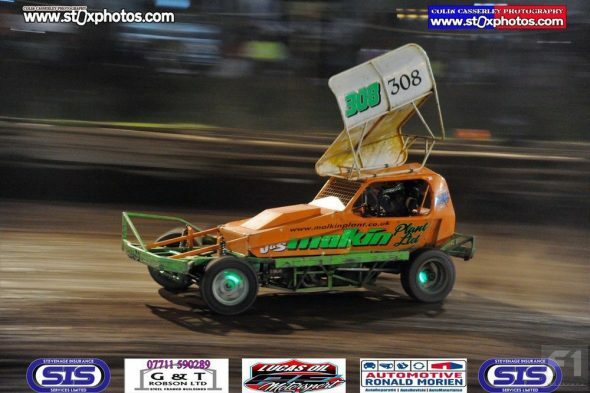 Before this piece starts, to read like the Racing Post let’s get straight on with heat one which raised 17 cars, including four SO contenders: Fairhurst, Hunter, Hines and Wainman (555) and Liam Gilbank (20) making his F1 debut. 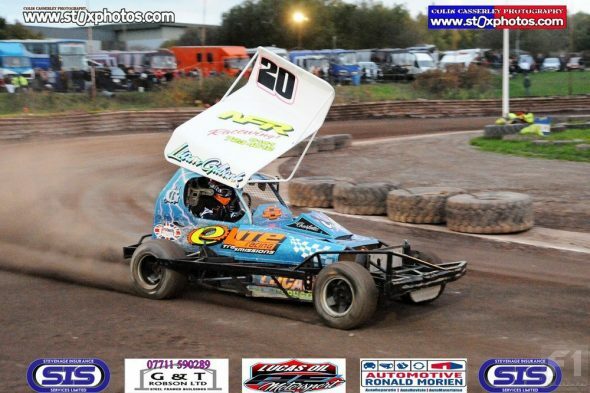 The 217 car faltered early on but Will Hunter (220) had no such problems, taking second by the half-way but still a long way behind leader Steve Malkin Junior (308). Malkin had led from the drop of the green and despite the 220 looming large in his mirrors kept his cool, even when Hunter sent him wide on the final lap. Into the last bend Malkin gave Hunter a massive hit, sending him hard into the armco but then the 308 car seemed to jump out of gear just long enough for Will to scrape off the fence and take the flag. An excellent effort by the white top and another load of points for Mr. Hunter. 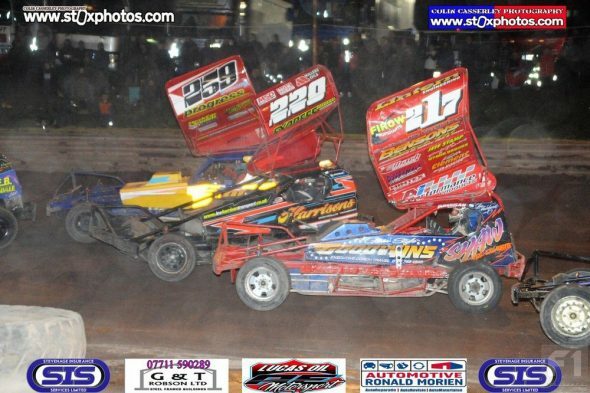 Twenty for heat two with the top three in the Shoot Out, Wainman, Wainman and Newson (sounds like a firm of solicitors) lined up at the back. A slight delay while Kyle Gray (124) jumped out of a V8 and into his F1 (Kyle, Frankie JJ and Finn Sargent had all taken part in the V8 Under 25 Championship earlier) before the starter waved the green flag and away went Jake Harrhy (345) into the lead. Newson got in a quick sideswipe on FWJ to set him back and the 16 pilot clearly meant business, looking fast from the outset. A caution for a winded Ashley England (346), stuck on turn two after an assault by Scriven (11) and Newson brought out a caution. Netherlands driver Mark Veenstra (H181), trying out the yellow Booth (446) machine apparently with a view to purchase, stalled on the restart. With the infield tractors ignoring him FWJ drove from turn two to the pit gate to give him a push. I read that Mark has come from F2 Junior racing and apart from his five laps pre-meeting, this was his first time in an F1. 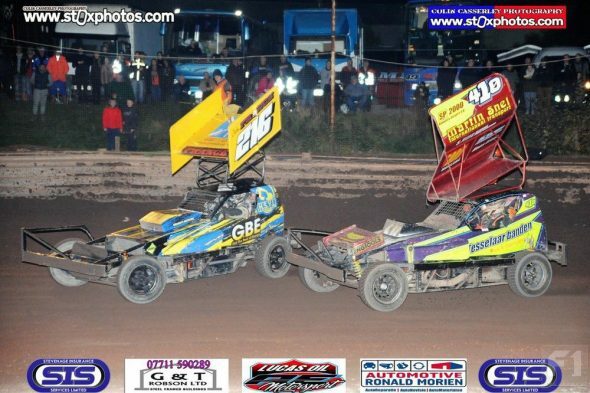 With mainly white and yellow tops ahead of him at the restart Newson looked on for a win, especially as he passed about six of them in one go on turn two but FWJ stayed with him, punting him wide on the pit turn as Sam Jacklin (137) took over. 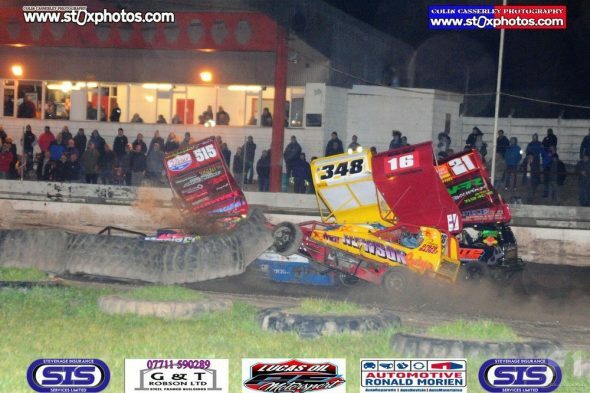 Newson looked to lay the 348 car into Wainman but climbed the marker tyres and lost time, before disappearing onto the centre with a flat tyre. 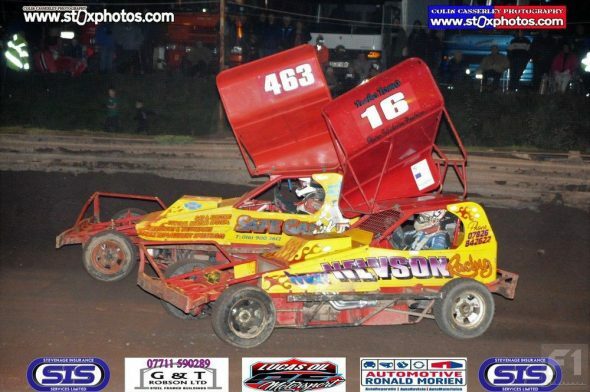 Jacklin pressed on in front taking the flag for a fine victory ahead of FWJ and Harrhy. No fairy tale ending for Veenstra sadly, the H181 disappearing in a cloud of expensive-looking oil smoke with just a couple to go. 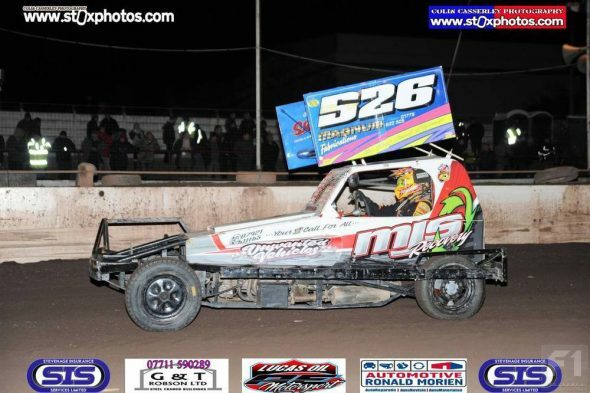 Mark Sargent (326) took his second win in as many weeks in the 18-car consolation which proved to be a rather dusty affair. Mat Newson hit more trouble just before a caution was called to remove the Karl Roberts (313) car from the fence, the 16 car coasting onto the infield and out of the race. Fairhurst made it up to second and attempted a long range last bender – but missed, while Liam Gilbank finished in a fantastic fifth place. 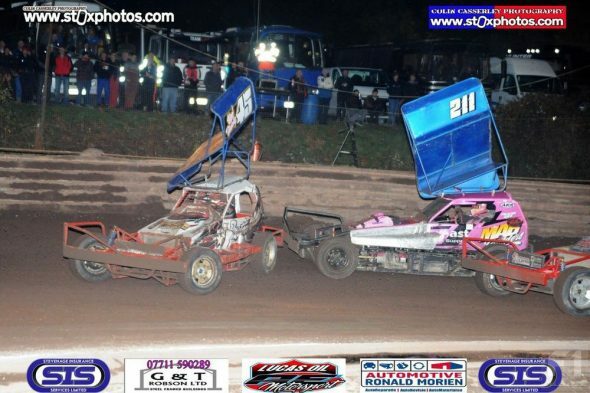 Twenty-five cars for the Bill Bridgett Memorial trophy final which turned out to be a memorable event, red flags flying on lap one as both Scriven (11) and Harrhy (45) tipped onto their sides on turn one. 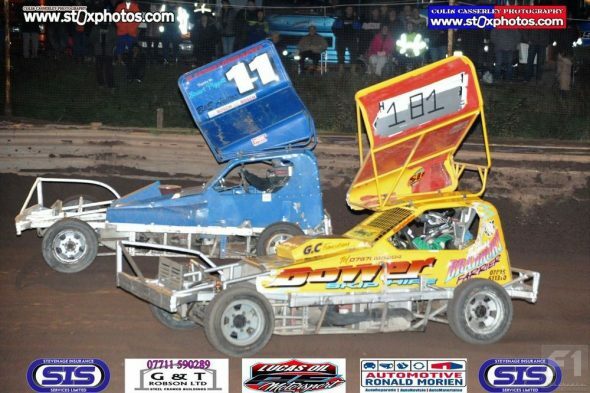 A complete restart was ordered, minus 11, 45, 183 and 345 and it was Jacklin who took the lead but a big pile up on the pit bend involving around nine cars brought out a caution. 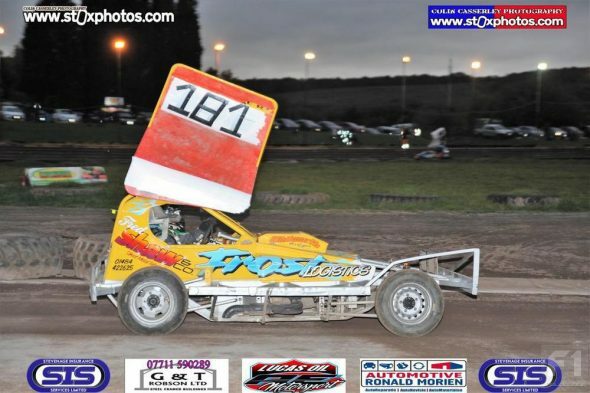 Jack France (216) was judged to be the cause of the yellow flags and was sent to join the infield car park. Another lap or two of racing and the yellow flags were raised again, this time for Liam Gilbank, in the fence on turn two. The next restart was comical – the starter waved the green flag and nobody went! Maybe they thought they were getting a full rolling lap. 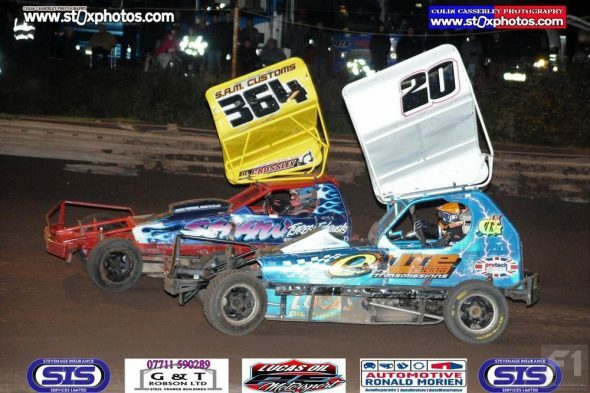 The cars further back got the hint and went, swamping the leaders and Mark Woodhull (335) found himself in the lead from Hawkins (175) and Jacklin. 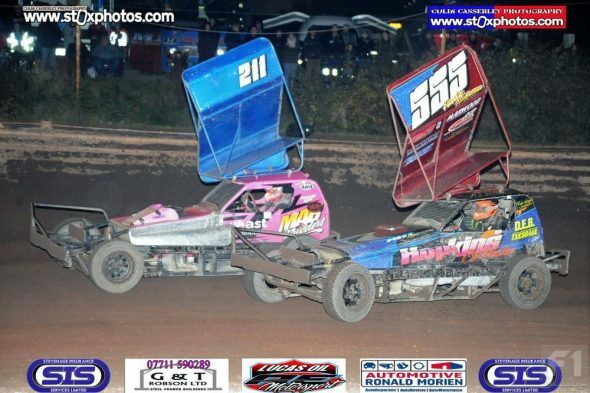 Hawkins then found the lead, Jacklin found the fence and an errant tyre wandered around the home straight as Frankie Wainman Junior hit the front with Hawkins and Frankie JJ behind. The track was again dusting up and looked quite slick, FWJ adjusting his driving style to suit and easing it around the bends, taking no chances. Uncle Danny (212) came into the picture, edging out JJ for second in the closing stages to make it an historic 1-2-3 for Team Wainman and a bundle of shoot out points to boot. Twenty-three for the grand national with all the main protagonists on track, FWJ taking the lap handicap. 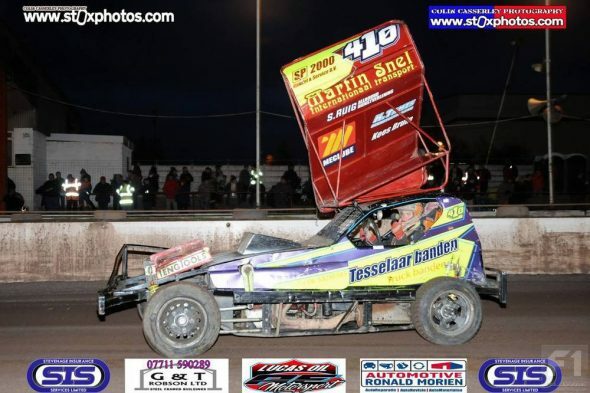 Jelle Tesselaar arrived just too late from the pits to be included after changing the gearbox on the H410 machine between the final and GN – another couple of minutes and he would have been trackside. Jake Harrhy led but a big pile up on turn three claimed a few bringing out the caution flags after just three laps. After a good start Mat Newson lost his way somewhere, taking the restart as tail-end Charlie. 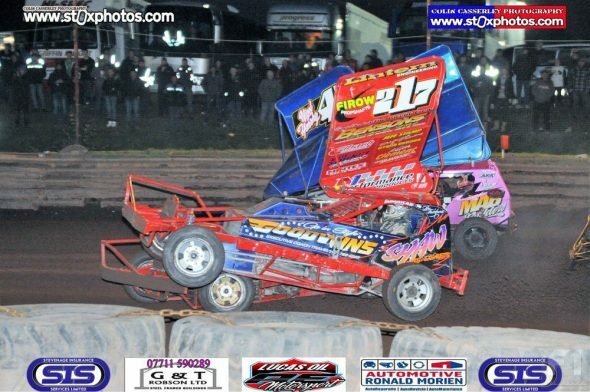 Turns one and two became lost in clouds of dust as both Hines and Wainman (212) made good progress. 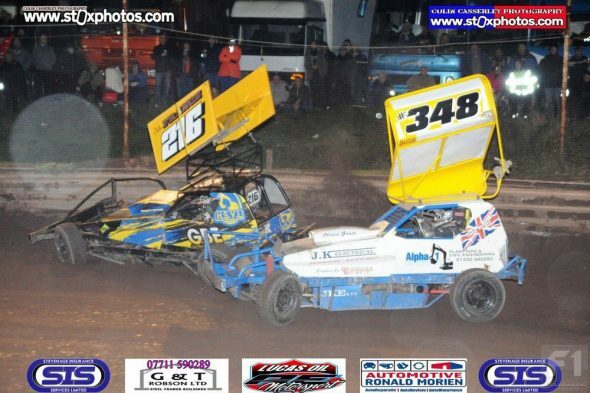 FWJ tangled with James Morris (463) just before the halfway, clambering over the turn four marker tyres and suffering a flat tyre but continued circulating. 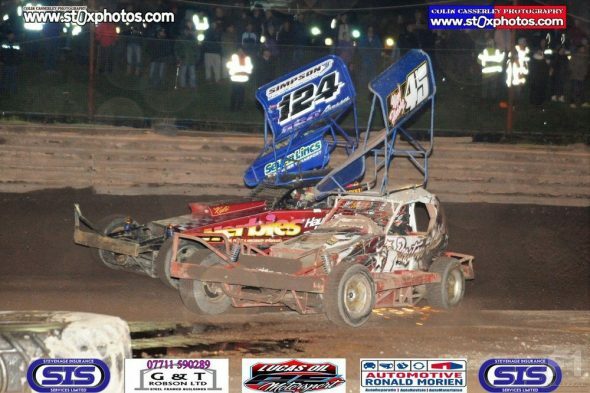 Harrhy was passed by Roberts with five to run but the 313 car was challenged a lap later by Hines, the 259 machine half-spinning and allowing 212 to take over at the front, until he drifted wide and let Hines back ahead to take the flag. 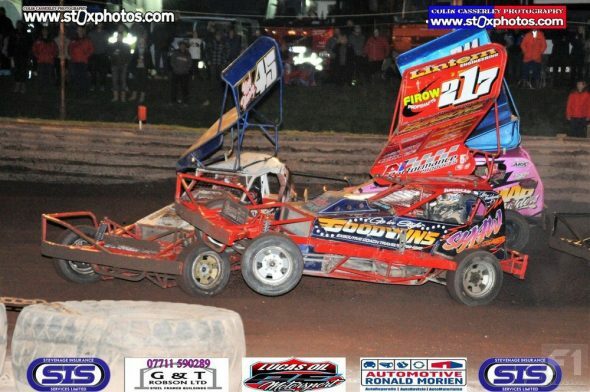 In a final twist, the Hines car failed post-race scrutineering handing the race victory to Danny Wainman and moving FWJ up to twelfth place and a useful 6 more points. With just the double points finale to go at Belle Vue, Frankie Junior holds a 34 point lead over Danny with Mat a further 6 points behind. Fairhurst and Hunter have a mathematical chance of taking the silver if the top three fail to score sufficiently. It’s nail-biting stuff make no mistake.